I wanted to take a photo of this statue, of Terry Fox, but struggled for a bit on finding a unique angle. Lots of folks have been to see it in recent weeks, since it was unveiled and getting an original take is a little tricky. In the end, I selected a fairly tame, yet comprehensive angle that lets you clearly read the quotation and see the detail of the statue, but also reveals the symbolic shadows cast. Opted for a night exposure at a small aperture, to make star-bursts of the lights and to really capture the detail of the sculpture. The statue is larger than life-sized and the enormous shadows give life to the giant dream that the real man envisioned. Oddly enough, although the photo still looks tilted to my eye, the text is straight and the man is upright. I think the lights and shadows must be playing tricks with perspective, here. 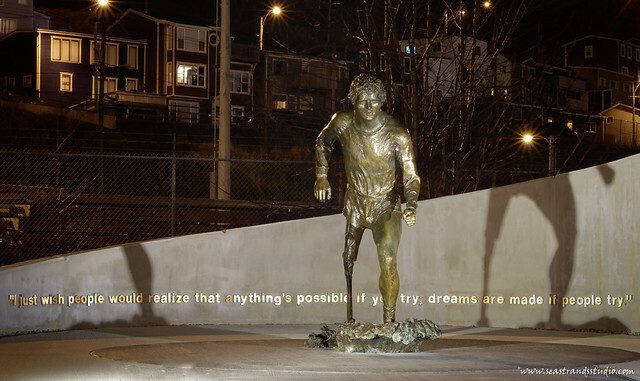 The Terry Fox Memorial at Mile O, where Terry dipped his artificial leg in St. John’s Harbour before starting his almost unbelievable run across Canada. He ended his physical run in Thunder Bay, when his cancer returned in force, but his family has continued the philosophical and fundraising aspect of his journey in his memory. Millions upon millions of dollars have been raised for cancer research, started by one runner in the rain. I have hauled myself out of bed to run long distances, but I can’t fathom running marathon after marathon, day in, day out. It’s almost unimaginable even to someone with both legs and a cancer-free body; I cannot comprehend the magnitude of the vision that kept him going. The statue was created by Luben Boykov and is located on Water Street, at the base of Temperance Street.